I think there is an error in your data, can you verify what is correct? If you think you’ve found an error in property and transaction data, please let us know! Details on how to contact us below. This applies to all data except owner phone and social. If you identify a bad phone number or social contact, just remove from the contact using Edit Contact. Know that public records are messy and rife with errors. In some instance, we are able to correct. In some cases, the error is a public record, it can only be corrected by the agency responsible. Contact the PropertyRadar Support team from within the Web or mobile application using Contact Support from the main menu. Please provide AS MUCH information as you can about the error. The more context you can provide in your message, the more effective our data research team can be to correct. 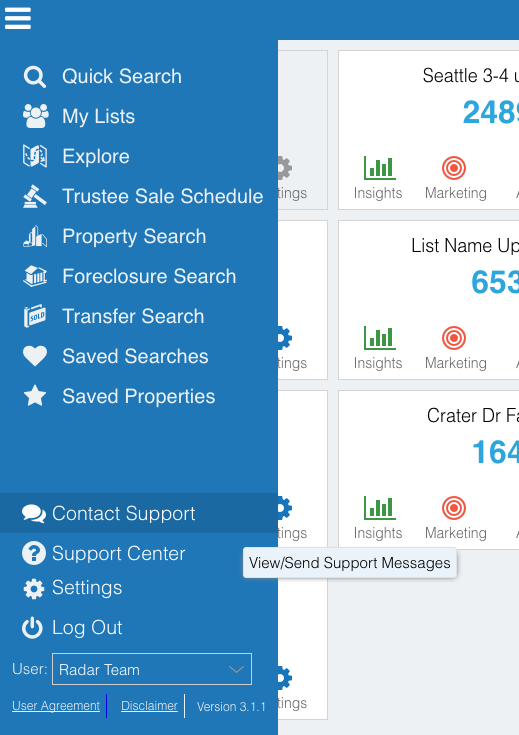 After logging into the app, you can contact the PropertyRadar support team from the Main Menu Chat Option to Contact Support. Click the Main Menu, then click “Contact Support.” A chat will open. Click “New Conversation." Enter your message. You can also click on the chat icon in the lower right hand corner of your screen. If you’d prefer to schedule a call with the support team about an error, click “Support Center." You will be redirected to a page where you can schedule a call.